*The last three tracks weren’t on the original album, but they appear on every CD reissue I’ve seen. Since I first heard the album on CD, I’ve included them here. Imagine a chilly, dreary Monday morning. You might be lounging on your living room couch, waiting for the coffee to brew, or stuck in traffic in your car or on a packed-to-the-gills bus, or even sitting at your desk, faced with an inbox full of unread mail. Wherever you are, no matter how you listen to your music (CD player, ear buds, iTunes or Spotify on your computer), you dial up DUSTY IN MEMPHIS and its opening song, “Just A Little Lovin’”. Its first ten seconds of lush, orchestral fanfare gives away to Dusty Springfield’s husky, delicate vocal—she sounds, as always, impossibly beautiful yet fully approachable, beaming with strength and reassurance (but not the kind that’s easily earned). All the grey and dourness surrounding you just fades away as she sings, “In this world / it wouldn’t be half as bad / it wouldn’t be half as sad / if each and everybody in it ha-aad / (dramatic pause) Just a little lovin’.” The song, like its parent album, is pop music at its most transformative, born out of a serendipitous confluence of vocalist, musicians and material. At the time, Springfield was a 29-year-old London-born singer who had first achieved success six years before with a string of hit singles spanning the perky pop of “I Only Want to Be With You” to her English-language rendition of an Italian torch song, “You Don’t Have To Say You Love Me”. Although often categorized as the era’s premier practitioner of “blue-eyed soul” (to be blunt, white people performing black music), you sensed she could sing anything, putting her own stamp on whatever she attempted. For that, American audiences embraced her more wholeheartedly than initial English contemporaries like Cilla Black and Sandie Shaw. Springfield’s love of and ability to more-than-credibly perform such American music as Phil Spector, Stax/Volt and Motown led her in 1968 to sign with Atlantic Records and work on an album at the American Sound Studios in Memphis, Tennessee. The sessions were produced by Jerry Wexler and Tom Dowd (who had both recently worked with Aretha Franklin) and were backed instrumentally by the Memphis Cats, session musicians who had also played on recordings by Wilson Pickett and Memphis’ favorite son, Elvis Presley. 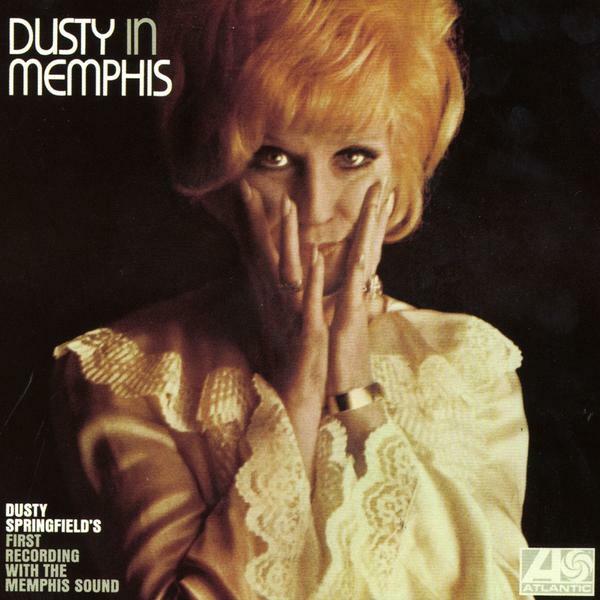 So, Dusty went to Memphis and made her most famous, enduring album, right? What actually happened is a little more complicated. An all-out perfectionist, Springfield was reportedly unhappy with a majority of her vocal takes in Memphis, to the point where what’s heard of her on the final album was actually recorded later in New York, where she sang along to the Memphis-produced rhythm tracks. For an album called DUSTY IN MEMPHIS, this revelation’s nearly up there with finding out Santa Claus doesn’t exist, yet one mustn’t let this color one’s own perception of the final product. Springfield’s aesthetic, after all, was as committed to authenticity as it was to artifice: she could sing rings around any other pop star (‘cept for Aretha, arguably) and would often do so while wearing a dyed-blonde bouffant hairdo and over-the-top makeup and dress that would inspire many a drag performer. Once “Just A Little Lovin’” fills the air you simply don’t care where it was recorded because it sounds so sweet, so right, so complete—you wouldn’t change a single thing about it. As with most other singers of her era, Springfield was not a songwriter but an interpreter. On DUSTY IN MEMPHIS, she and her producers cherry-picked selections from an elite assortment of tunesmiths: Barry Mann and Cynthia Weil (the aforementioned “Just A Little Lovin’”), Randy Newman (the uplifting “Just One Smile” and the melancholy “I Don’t Want to Hear It Anymore”, the latter evocative enough to make one long for never-ending rain), Burt Bacharach and Hal David (a faintly psychedelic, sitar-accentuated take on “In The Land of Make Believe”) and no less than four selections from Gerry Goffin (RIP) and Carole King—the best of which, “Don’t Forget About Me” nimbly alternates between yearningly genteel verses and a pleading, belting, triumphant chorus. While Springfield is clearly the song’s star attraction, she’s also gifted enough to know not to overpower the arrangement: without those horn parts working in tandem with her vocals, the song wouldn’t soar so high. Likewise, the album’s highest highs are a result of how Springfield supplements the arrangement and also allows herself to be enriched by it. “Son of a Preacher Man”, the album’s biggest hit works not only because of Springfield’s phenomenally nuanced reading of it but also by the way her slinky tone and the horn blasts appear as sort of a call-and-response, each one slyly commenting on the other. “Breakfast in Bed” boasts a pillow-soft opening that makes you never want to get out from under the covers. Seductive and deeply emphatic, Springfield coos over soulful guitar and electric piano licks, but as the ballad effortlessly ramps up to its horn-filled chorus, her temperament shifts naturally as well, retaining warmth and charm while displaying more assertion and urgency. Michel Legrand’s elegant “The Windmills of Your Mind” may seem like an odd duck on DUSTY IN MEMPHIS, due to its lack of seemingly having anything to do with soul or the American South, but its sumptuous orchestration and Springfield’s performance (she plays as well with string sections as she does with horn charts) makes it fit right in with the album’s earthier moments (listen to how convincing she is on the nearly funky bonus track “Willie & Laura Mae Jones”, and how much fun she’s having as well). Alas, DUSTY IN MEMPHIS is only a drop in the bucket when it comes to Springfield. I could go on about her definitive covers of songs as disparate as “Spooky” and “Make It With You”, her transcendent part on Pet Shop Boys’ “What Have I Done To Deserve This” (briefly reviving her career in the late ‘80s), how Quentin Tarantino’s usage of “Son of a Preacher Man” in PULP FICTION made both the film scene and the song iconic, how she was a closeted lesbian, how breast cancer ended her life just before she was to turn 60. Still, for all of these facets of her life and career, would we be talking about Springfield if she hadn’t recorded an album as alive and accomplished and letter-perfect as this one? Perhaps, but then we’d only remember her via a series of overlapping compilations, as is the case with another female singer we’ll hear from a few entries on. Up next: one of two albums I first heard when I was 17 that had a massive impact on my taste in music.